As we sailed across what I would soon find out is the world’s tenth largest lake, we could not help but think about the dangers that this place contained for any traveler. We were on our way to Isla Ometepe in Lago, Nicaragua. It’s a small island on the map but much bigger in real life. Why is it dangerous? For one, the island is home to an active volcano that should erupt once about every 50 years. It hasn’t erupted since 1957. The math worried me. But more about that in a minute. Another particularly dangerous feature of the island: If an eruption occurs, and you’re in the water, then swimming for your life might not be the best of ideas. Even if that doesn’t scare you away, the lake is also home to one of the world’s only species of fresh water-tolerating sharks. How comforting! The sharks are bull sharks, a species known to — at times — enter into fresh water from the sea. Studies show that it takes the sharks about 7-11 days to make the journey up or down the rapids of the San Juan river from the Caribbean Ocean. One of our guides on the island believes that once the sharks are locked in the lake, after arriving from the ocean, they’ll stay indefinitely. But some sharks tagged in the lake have been caught later in the sea. Interesting, but no by means comforting — the bull shark is one of the world’s most aggressive sharks and responsible for the majority of attacks on humans! Needless to say we made it to and from without incident. It took about an hour to get across the lake to the island. The view of the island is absolutely fantastic, even breathtaking. We stayed in a dumpy little hostel but it served the intended purpose. One feature of the island was that every night at around 8 or 9 a torrential downpour would come through the island. It lasted each night for between 30 minutes and 2 hours. All the buildings (including our humble hostel) had tin roofs. 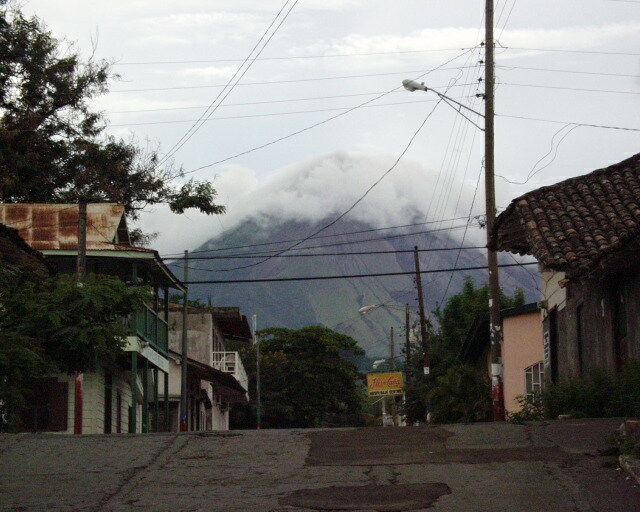 Clouds often shroud the peak of the volcano Concepción. Our second day on the island we climbed up the active volcano nearby called Concepción. The guides won’t tell you how hard of a climb it is because they want you to fill their pockets. Be assured, though, it’s grueling. The guide will only take you to 1000 meters, still 600 from the top. It is too dangerous to go any higher. Toxic gases, hurricane strength winds, impenetrable fog… Possible eruption! You get the idea. The view from 1,000 meters. Up to the last 100 meters of the climb, you find yourself trekking through a dense rainforest. You see snakes, pink lizards, dung beetles, every biting insect you ever knew existed and then some more you didn’t. Then there’s the monkeys. There are large colonies of Capuchin and howler monkeys on the trek. Some will actually converse with you if you can master their language. It was an exhausting journey to the (pseudo)-top, but well worth the 7.50 USD a person. The view was absolutely stupendous. Another neat feature of the island is its archaeology. 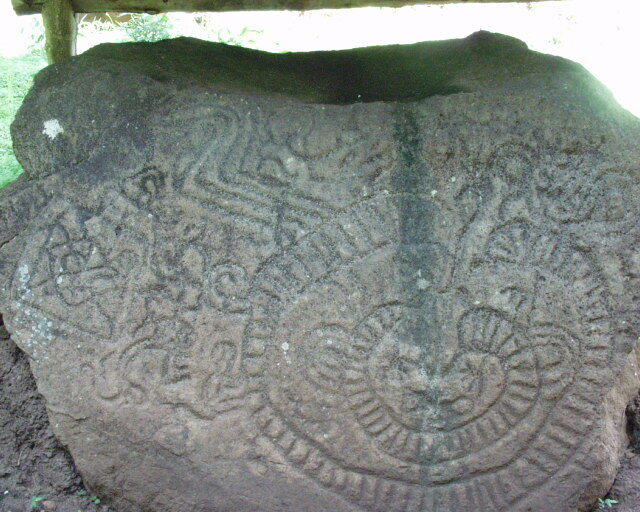 At several sites on the island you’ll find petroglyphs. We were told that some of them are over 2,000 years old. It’s fun to try and figure out what the drawings depict. Some of them gave us a run for our money. It also gave us appreciation for the forefathers of the island’s present 35,000 inhabitants. 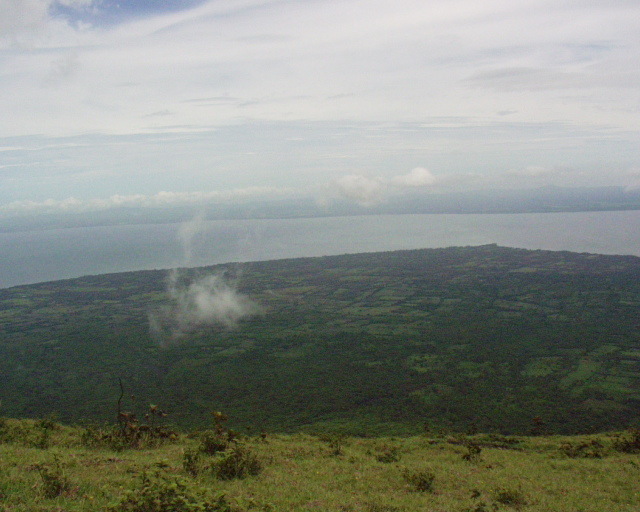 The other volcano, Maderas, can be climbed all the way to the crater, which converges into a beautiful lagoon. We opted out (seven hours uphill through the mud didn’t sound as exciting as the lagoon at top). Maybe next time. Isla Ometepe is an enchanting place. The food and people are more-than-agreeable and the views, incredible. One tip though. If you’re on the ferry (the big boat), don’t miss out on the air-conditioned room upstairs. It’s a lifesaver. The two flat screen TVs kept us all entertained with 1980s music videos. 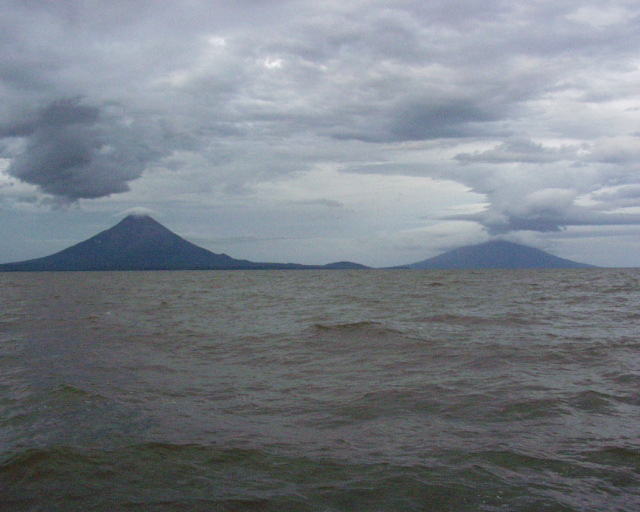 Isla Ometepe — I’d say it’s definitely on my list of world wonders. This entry was posted on Thursday, July 17th, 2008 at 8:00 am	and is filed under Geotagged, Must See Geography, Physical Geography. You can follow any responses to this entry through the RSS 2.0 feed. You can skip to the end and leave a response. Pinging is currently not allowed.